the church rises fortress-like above the street, its massive walls showing no clear inviting entryway. It is only when the driver turns into the parking lot from Samaritan Road that the building opens, and the visitor is invited to enter. The building turns its back to the street; its entrance faces the buildings to its north, the buildings that originally composed the Episcopal diocese’s Good Samaritan Center: Child’s Hospital, Nelson House and St. Margaret’s Home. St. Paul’s, which it was hoped would become the chapel for these institutions, faces and invites those that it serves. This explains the orientation of the building. 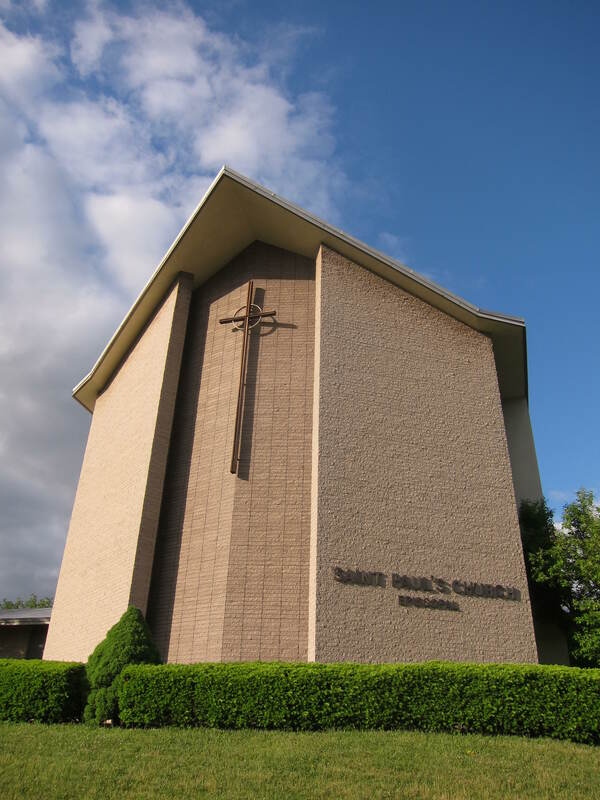 but how did the church building come to be placed so high above the roadway? To answer this question, we first need to understand that in the mid-1950s the eastern section of Hackett Boulevard was unpaved, and reached only from Holland Avenue to what is now Samaritan Drive, where it angled northward to provide access to St. Margaret’s Home. 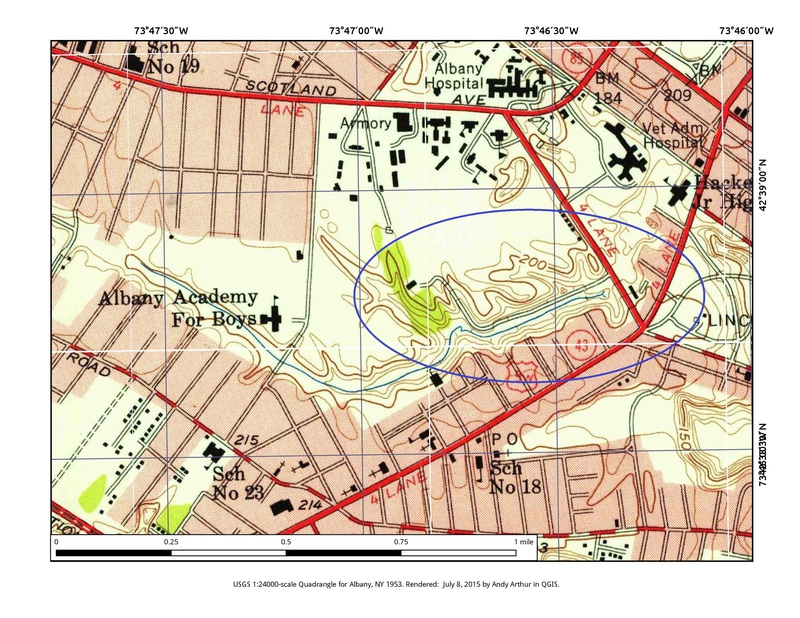 A 1953 USGS topographic map of this area (provided by Andy Arthur, with a blue oval enclosing the area) shows this road stub clearly, as it follows the bed of a small creek and then bends north toward St. Margaret’s Home. The creek flowed through quite a deep ravine along its entire length, with another, deeper gully (parts of it colored green to indicate that they were wooded) branching off to the north just east of St. Margaret’s Home. 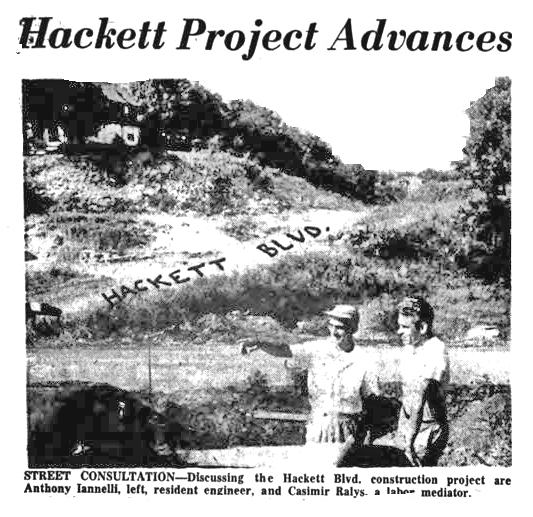 It was only in 1959, as part of a larger plan to develop the University Heights section of the city, that Hackett Boulevard was extended from Holland Avenue to Academy Road. This photograph, taken early in the project, shows how drastically the landscape had to be changed to create Hackett Boulevard as we know it now. But how can we visualize where St. Paul’s was placed, what the landscape looked like before construction began, and why the church now stands so high above the roadway? By cartographic magic, Andy Arthur has laid the 1953 topographic map over a 2014 aerial photograph. Hackett Boulevard was paved and extended to follow the line of the creekbed, at the bottom of the ravine; the northward bend to St. Margaret’s is now Samaritan Road, extended to serve the entire Good Samaritan Center. 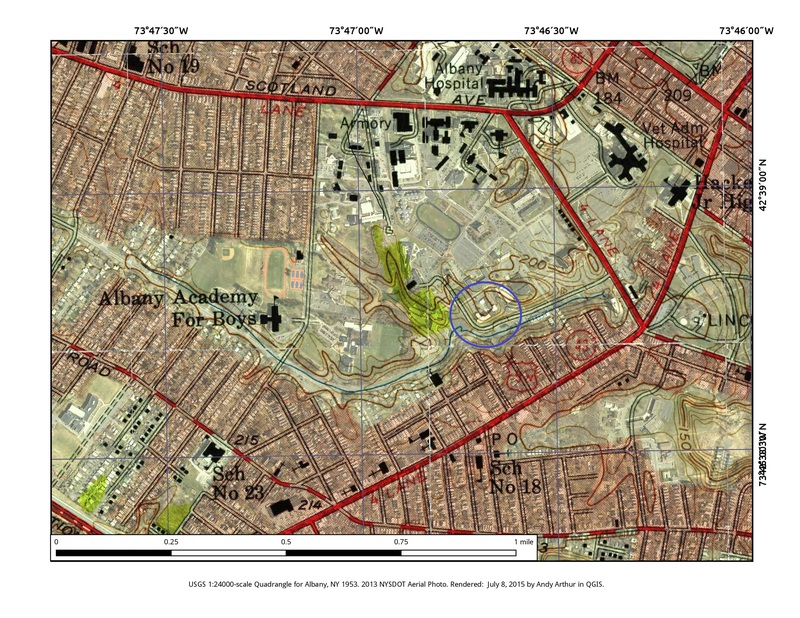 St. Paul’s (indicated in a blue circle) was not built on an artificially-built platform , but on the only level spot available at the entrance of the Good Samaritan Center, placed high above the creek, now flowing underground. This is the geography that produces the imposing view our visitors now see. This entry was posted in Hackett Blvd Building on August 11, 2015 by Paul Nance.